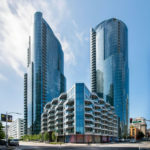 The number of single-family homes and condos that traded hands across the greater Bay Area in September dropped an above average 13.6 percent from August (8,490) to September (7,338) and were 7.5 percent lower versus the same time last year and a three-year low for September. 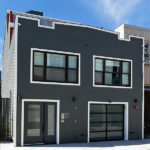 And in San Francisco proper, sales volume dropped 25.3 percent from August (494) to September (369), which is over three times the typical seasonal decline. And on a year-over-year basis, sales were down 32.5 percent, which is the largest year-over-year drop since 2009, according to recorded sales data from CoreLogic. In Alameda County, recorded homes sales dropped 16.9 percent from 1,860 in August to 1,546 September, which is 7.8 percent lower versus the same time last year; sales in Contra Costa County dropped 15.3 percent to 1,490, which is 11.8 percent lower on a year-over-year basis; and sales in Solano County dropped 9.4 percent to 655 in September, which 12.8 percent lower versus the same time last year. Home sales in Santa Clara County dropped a seasonal 6.9 percent from 1,861 in August to 1,733 in September and were 3.4 percent higher versus the same time last year, while recorded sales in San Mateo County dropped 14.0 percent to 573 in September which is 3.2 percent lower, year-over-year. Up in Marin County, sales slipped 5.5 percent to 277 in August but were 9.9 percent higher versus the same time last year; sales in Napa dropped 13.1 percent to 119 in September which is 14.4 percent lower, year-over-year; and home sales in Sonoma County dropped 17.5 percent to 566 in September which is 5.7 lower versus the same time last year. 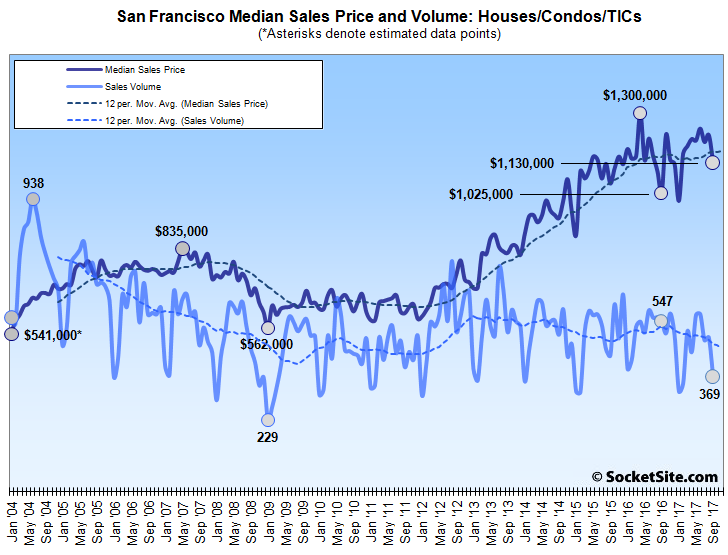 The median price paid for those aforementioned 369 homes in San Francisco was $1,130,000, down 7.7 percent from the month before, down 9.3 percent since June, and 13.1 percent below the record $1.3 million median price recorded in April of 2016 but 10.2 percent higher versus the same time last year. The median sale price in Alameda County was $755,000 in September, down 0.6 percent from August but 13.9 percent higher versus the same time last year; the median sale price in Contra Costa County was $560,000 and 10.7 percent higher versus the same time last year; and the median sale price in Solano County was $400,000 in September, up 0.5 percent from August and 12.4 percent higher, year-over-year. The median sale price in Santa Clara County was $950,000 in September, up 1.6 percent from August and 14.5 percent higher versus the same time last year while the median sale price in San Mateo County was $1,146,250 in September, down 0.3 percent from an upwardly revised $1,150,000 in August and 11.8 percent higher, year-over-year. The median sale price in Marin was $1,005,000 in September, up 4.1 percent from August and 19.6 percent higher versus the same time last year while the median in Napa was $570,000, down 4.3 percent from August and 1.4 percent lower versus the same time last year; and the median in Sonoma was $571,500 in September, down 0.2 percent from August but 7.9 percent higher, year-over-year basis. And across the greater Bay Area, the median home sale price slipped 0.1 percent from $740,000 in August to $739,000 in September but remains 13.7 percent higher versus the same time last year. No one stat or one data point is definitive. But consider how consistent this report is with the ‘buyers are camped out on the sidelines and will swoop in to correct any price weakness’ theory v.s. the idea that momentum is a driving factor in the market. Medians aren’t prices, but there’s been increasing apple to apple price weakness yet sales are dropping. Buying at 2015 prices on the way up is attractive to many many people. Buying at 2015 prices on the way down is a very different proposition. I suggest you re-read the article. Prices are up 10-15% on an annual basis. Great, so where exactly do you see an apple-to-apple price weakening? 1) The apples-to-apples comparisons deal mainly with luxury condos in SOMA. This is about the only type of real estate which has seen a large increase in supply in the Bay Area over the past 2 years. This is not at all representative for the Bay Area real estate market. 2) Shiller-Case Index does not suggest prices are weakening on a year-to year basis. 3) Median prices are up 10-15% in the Bay Area as suggested in this article. None of these measures is perfect, but I personally give the Shiller-Case and Median Price year-over-year measure the benefit of the doubt. I really enjoy reading this site. Here are a few friendly suggestions. In this long sentence, you mention the 10.2% year-on-year price increase at the very end. This seems to be the most relevant piece of information. The 9.3% decrease since June and 13.1% decrease since September are seasonal. The record price of June 2015 is seasonal and fairly irrelevant to the 2017 market trend. I said it before and I’ll say it again. Please provide this information in a table format. This would make it so much more easy to read and understand. The typical seasonally driven drop in the Median price from August to September is actually only 2.4 percent (or 5.7 percent from June), versus the 7.7 (and 9.3) percent above. Ok, so if the seasonally adjusted decline in autumn 2017 was stronger than usual BUT prices are higher compared to September 2016, this means that the seasonally adjusted increase in spring 2017 was far stronger than usual too. After adjusting for seasonality, we end up with a price that is 10% higher than last year and that’s what matters in my opinion the most. I would strongly suggest to lead with the year-on-year changes and then dive into some seasonality figures, rather than the other way around. Here is the problem with how people look at upward swing and downward swings when it comes to housing. They are not anywhere close to being equal. A price appreciation is assumed to be a healthy gain and a norm. Ie, the price of houses are assumed to be an appreciating assett. You expect your house /condo to gain a nominal value each year. However, a decrease in value is a much bigger deal and its impact is far greater. It means for one, you might be under water, it also means real estate as an investment at that point is negative. It also means, there is an incentive to wait on buying. Appreciation and depreciation are completely different animals when it comes to housing. It’s not just assumptions and perceptions though, it’s reality as well. Literally everyone can afford to take a gain. But if you look at savings data, far far fewer people can afford to take a loss. And generally people are levered into a housing purchase and data shows that people now are getting in at very high price to income ratios, so even small declines can be very significant. Ho hum. Volume down, and prices up 10% year-to-year. That’s exactly what one would expect to see in a low supply – high demand environment like we have in SF right now. These numbers are right in line with the case shiller numbers. Yeah, a year on year median price increase of 10% really should be the headline of this post. Instead it is below the e-fold and only after a bunch of less meaningful figures, like month to month seasonal decline. I just don’t get it. Maybe the volume figures are significant (I have my doubts) but can they possibly be more significant than a 10% median price increase? First off, median’s aren’t a good measure of price changes. A relative decrease in sales below the median (or increase in sales above) can change the median regardless of whether these sales were up or down in the apples to apples sense. Secondly, the market is at a transitional point. A YoY comparison is one thing in a market that is smoothly rising or falling for years at a time, but during a market transition a year is a long time. Any chance of adding a vertical lines at Jan 1 of each year? Seasonality is obviously present, but it’s hard to visually align the peaks and troughs in the graph to the quarters listed on the bottom axis. If the Republicans succeed in reducing the deductible mortgage interest from the current 1 milion dollars to $500,000, SF and SJ will take a huge hit in Home sales. Oakland will do much better since the current median is just under $700,000. The GOP plan will be a disaster for SF real estate. Yes and no. SF real estate attracts a lot of all cash buyers who will not need to take into consideration the mortgage interest deduction as an income tax offset. It may impact the middle class buyer who is relying on the deduction to fund their purchase of a home in which case they will look at buying a smaller home or in a different neighborhood. I really think this will hit SF extremely hard. The mortgage deduction is a huge deal. People will buy where they will get the tax deduction instead of spending 1.2 million on a home where possibly no deduction for the second $500,000 in the mortgage. Hard to believe that the all cash offers in SF comprise a huge percentage of buyers. Actually, I disagree. I moved from SF to Oakland a few years ago, because I wanted a SFH with some character and a nice back yard, etc. It cost me around twice as much as what our place sold for in SF, and tax deductions really weren’t a consideration. Additionally, property tax rates in Alameda County are significantly higher than SF, so I would argue capping those at only $10K will be a bigger deal for Oakland buyers. And finally, the AMT caps deductions currently for those who are buying homes in SF. That is actually one benefit of the newly proposed plan — AMT goes away. I know you love your city, which creates a natural bias, but your analysis here is completely off-base in my opinion. As someone who has been trying for a few years unsuccessfully to buy into our competitive SF neighborhood, I agree completely. As soon as I saw this proposal I ran the numbers on how people in our shoes would be affected: trying desperately to buy into SF at the <= 1.25M price point with 20% down. I.e. "the low end" by local standards. Depending on implementation details, the cash flow implications of either a capped (only first 500K) or absolute (zero deduction) loss of mortgage interest deduction, make a purchase at 1.25M with current deduction comparable to a 1.5M purchase. Or to flip that around, to have the same just-makable housing cost on a 1.25M property today, you could bid less than 1M if the deduction goes away. So the $1M question is absolutely: how elastic is the bottom of the SF market? I don't believe anyone knows. My own guess is that's fairly inelastic, i.e. that there are enough cash-rich or family-backed or investor buyers at the low end looking for flips in neighborhoods in mine (even now), that the prices would not drop anywhere near enough to maintain parity of affordability. Sellers used to massive gains and starry numbers are not going to take less IMO no matter what the spreadsheets say. They'll just get sell to a lot more cash-rich buyers. People like my family? SOL. Exactly as the intended by a GOP looking for a wonderful way to say F-you to affluent blue state voters who are their prime political enemy. There was talk during the 2007 cycle that SF would not see price declines because of wealthy buyers rushing in to buy the dips and sellers refusing to take less then their expected gains. Obviously that didn’t happen. There are certainly people and properties where money is no object, but they are few and far between. Generally on the down slope, the less fortunate can’t afford to take a loss and the rich didn’t get and stay that way by volunteering to take a loss. The investor and flipper angle is more on target. So long as prices are rising demand will be large as people perceive themselves to be buying into a huge gain. But what investor or flipper (or buyer even) wants to buy into a loss? In addition to the mortgage deduction, there are many out there right now who are calling for higher interest rates, which will mean higher monthly payments, which will translate to downward price pressure. Few people want to buy in a declining market. I haven’t seen anyone mention that the State Income tax deduction is proposed to be eliminated, this is a double whammy on top of the mortgage/property tax elimination. you still get the mortgage interest deduction up to 500K, and if you’re in AMT (which most people are who are buying million dollar homes), the deduction is already limited. Mortgage interest deduction isn’t affected by AMT except in unusual circumstances like interest on a second home. But the “Pease Limitation” reduced the interest deduction for most SF home purchasers, who tend to have high incomes, along with all other deductions. So I agree with your conclusion that the proposed $500,000 change won’t impact things. The GOP plan to reduce deductible mortgage interest is a missile directed at the democrat’s power base. It will reduce net income in liberal states and weaken their ability to fund future campaigns. Sure, it is just a small marginal impact but as we have seen in the recent presidential election that’s all it takes to win. Did you every think that the lowering of mortgage interest rate deduction to $500’000 would hurt future appreciation of Oakland homes as well? At a price level of $700’000 your 20% mortgage will already max you out in terms on MID. Any further appreciation does not benefit from a tax deduction. Income and wealth levels are still significantly lower in Oakland than in SF, therefore, the impact of this change as a percentage of your disposable income could be much more felt in Oakland than in SF. The proposed changes in the tax code (mortgate and property tax) is potentially huge, and for could impact CA in a materially negative way (as intended). But I’d give the proposed changes a 20% chance of passing with no major alterations. If they did pass, I’d have my company to relocate me to an office in a state with no state income tax.